This month we want to see stamping, inlaid die-cutting and one other technique or product (use the list on our right hand sidebar of the challenge blog for ideas). The sentiment banner was stamped in Delicata Gold ... love this gold ink ... it's so metallic and sparkly without having to heat emboss. I popped up the panel onto my card base to give it a bit of dimension. 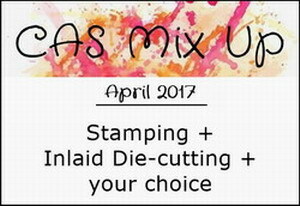 My CAS Mix Up card has stamping, inlaid die-cutting, smooshing, and watercolouring. We excited to have Maria (White Mood) as our Guest Designer this month. Maria won the CAS Mix Up February Challenge - Corrugated Cardboard. Welcome Maria! I hope you'll have time to check out the challenge blog to see the gorgeous inlaid die-cut cards from the rest of our Design Team and our Guest Designer. You will be inspired! Gorgeous card Loll. Love how you made the poppies pop against the soft background. Another lovely smoothed background and your inlaid poppies are pretty.. 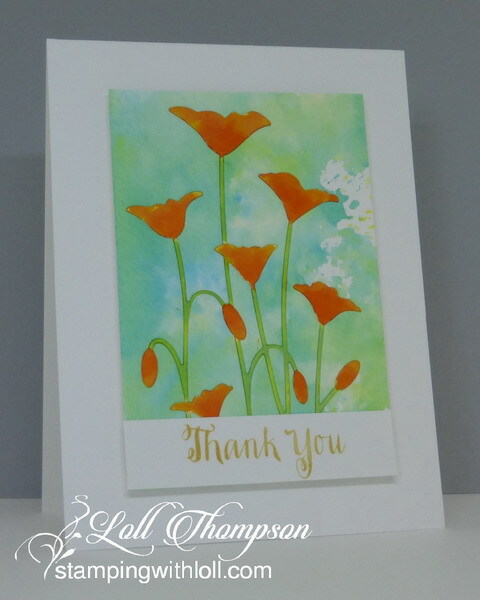 Your watercolored orange poppies are so pretty inlaid in the smooshed background, Loll! Love the gold sentiment that is so classy! I would have never thought to use this color combination and it's beautiful! Inlaying those skinny stems is not always easy but this is flawlessly done! Your backgrounds never disappoint! I love poppies too - and you've given them a beautiful treatment with the sloshed diluted ink on them. They look perfect inlaid in the green smooshing. Beautiful card! awesome inlay with the stems and gorgeous background to frame the poppies. What wonderful smooshed poppies and a fabulous die cut - one classy card Loll! stunning card - I love poppies too! Your background is gorgeous for these lovely poppies! That must have been a bit of work to put all the pieces together but the result is eyecatching! Beautiful card Loll, love the colours and smooching, so pretty and beautifully inlaid.